Water heaters may not run into problems as often as with heating and air conditioning systems, but they are still going to develop issues every once in a while. Even if you schedule preventive maintenance on a regular basis for your water heater, you need to make sure that you keep an eye out for signs that your system is in need of repairs. The earlier you can determine that your system is dealing with some sort of problem, the faster you can get the problem fixed. The following are just a few of the common signs that your water heater might be in need of repairs. Any time you see a leak in your water heater, you should call for repairs as quickly as possible. Even a small leak in the system can have massive consequences, as when a leak in the storage tank leads to the entire thing rupturing. Leaks in the circulation pump can interfere with properly moving water through the pipes, and valve leaks can do the same. Always have a technician check out leaks in your water heater, no matter how small. In areas with especially hard water, sediment buildup is a common problem for a lot of water heaters. As the sediment builds up in the storage tank, it will eventually reach the point where it actually insulates the water in the tank from the heat being produced by the burner assembly. 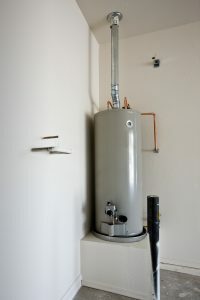 If your water heater seems to be having trouble providing enough hot water for your needs, it might be that you have an excess of sediment buildup in the storage tank. Having a professional clean out the tank for you should resolve the issue, if that is the case. Another possible cause of low hot water output from the water heater is a clogged burner assembly. The burner assembly is the part of the system that burns natural gas in order to generate heat. Carbon particles build up on the burner assembly over time, a natural byproduct of combusting gas. Eventually, this carbon buildup can become severe enough that it actually prevents one or more of the jets from igniting properly. If this happens, you’re going to need to have a professional clean the assembly to restore it to proper operation. If your water temperature at the faucet starts to fluctuate without warning, you may have a cracked dip tube. The dip tube is a PVC pipe in a tank water heater that keeps water flowing into the system separate from the already-warm water exiting the system. If the tube cracks, cold water from the water line can mix with the hot water leaving the tank and cause that particular issue. In cases like this, it is often necessary to replace the dip tube. Saddleback Plumbing offers comprehensive plumbing services in Mission Viejo, CA. Contact us today for an appointment with one of our professional plumbers.